Tired of the local park? Then head over to the DeCordova Sculpture Park in Lincoln. The meticulous grounds instill a sense of peace, and parents and babes alike will delight in the giant sculptures, elevated rock garden, and mini-waterfall pathway. 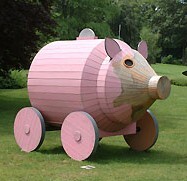 The enormous Trojan Piggy Bank (pictured) no doubt will impress guests of all ages. The Sculpture Park is open year round during daylight hours. Admission is charged during Museum Gallery operating hours only (Tuesday - Sunday, 10am to 5pm; $9 for adults, $6 for seniors, students, and children ages 6-12; children 5 and under are admitted free). Outside of these times, access to the Sculpture Park is free. DeCordova Members, Lincoln residents, and Active Duty Military Personnel and their dependents are admitted free at all times. See the Hours & Admissions info page for further information. The DeCordova also offers family-oriented educational programming to introduce kids to visual arts.